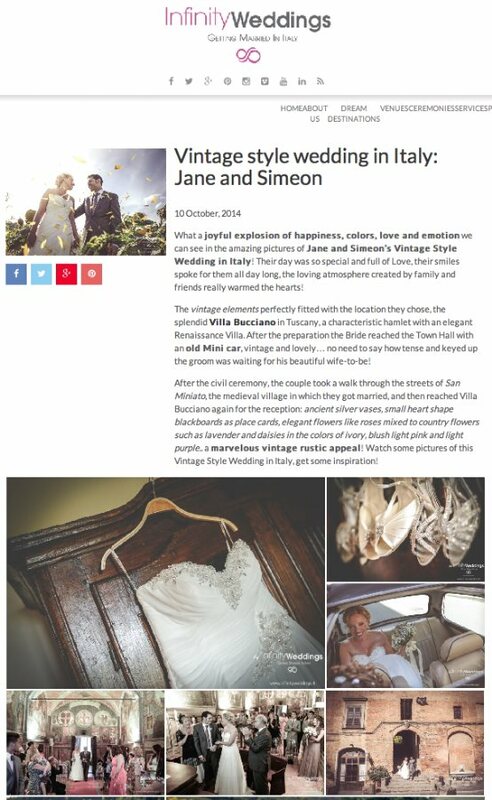 What a joyful explosion of happiness, colors, love and emotion we can see in the amazing pictures of Jane and Simeon’s Vintage Style Wedding in Italy! Their day was so special and full of Love, their smiles spoke for them all day long, the loving atmosphere created by family and friends really warmed the hearts! The vintage elements perfectly fitted with the location they chose, the splendid Villa Bucciano in Tuscany, a characteristic hamlet with an elegant Renaissance Villa. After the preparation the Bride reached the Town Hall with an old Mini car, vintage and lovely… no need to say how tense and keyed up the groom was waiting for his beautiful wife-to-be! After the civil ceremony, the couple took a walk through the streets of San Miniato, the medieval village in which they got married, and then reached Villa Bucciano again for the reception: ancient silver vases, small heart shape blackboards as place cards, elegant flowers like roses mixed to country flowers such as lavender and daisies in the colors of ivory, blush light pink and light purple.. a marvelous vintage rustic appeal! Watch some pictures of this Vintage Style Wedding in Italy, get some inspiration!